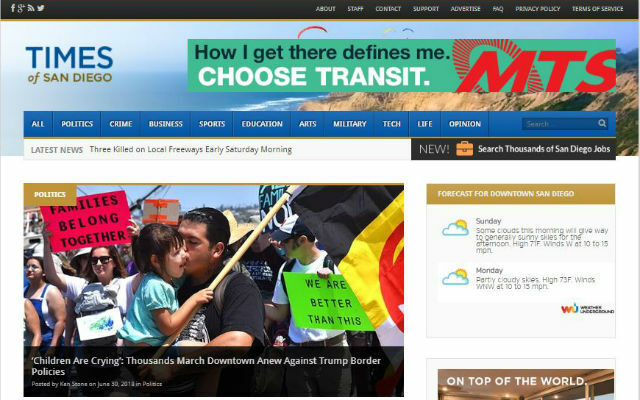 The Times of San Diego home page early Sunday morning showing local advertising. Times of San Diego was read by 367,004 people in June, a 64 percent increase from the 223,770 readers who used the website in the same month a year ago. The independent online news site, now in its fifth year, continues to report rapid audience growth as more and more San Diegans discover it and sign up for the daily email newsletter. The most widely read articles in June, according to Google Analytics, were coverage of the California primary election results, the story of a koala bear at the zoo being treated for diabetes, and the tragic suicide of a contract engineer at Qualcomm’s headquarters. 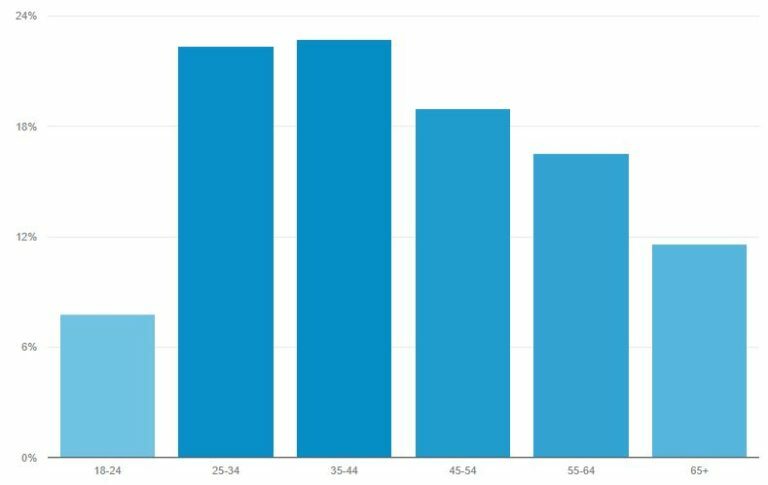 The website’s audience continued to be young, mobile and local in June. Millennials and Gen-Xers aged 25 to 34 and 35 to 44 made up the two largest audience segments, and a full 72 percent of readers were under the age of 55. Times of San Diego serves a much younger audience that traditional broadcast and print media outlets. Age of Times of San Diego readers in June as measured by Google Analytics. The website uses responsive design to automatically resize for different devices and participates in Google’s Accelerated Mobile Pages program. As a result, 68 percent of reading sessions were on smartphones and tablets. Desktops and laptops accounted for the remainder. Some 30 percent of readers were located in the city of San Diego, followed by 14 percent elsewhere in San Diego County and 10 percent elsewhere in Southern California. The balance were national and even international, especially because of coverage of the military and major San Diego companies. Times of San Diego’s staff of six contributing editors publish an average of 20 articles a day. The website is supported by local and national advertising and voluntary reader contributions. We’re in the midst of a crowd funding campaign to expand ourcoverage, adding more articles about local and state issues. If you like what we’re doing, please sign up for a small monthly contribution by clicking the red button at the beginning of this article.